Service philosophy of Future Associates. Future Associates’ philosophy grows from the recognition that the system of delivering human services is very complex. Indeed, Future’s staff spends many hours in training to learn how to effectively negotiate services from the system, although Future’s approach goes one step further. Realizing that the circumstances faced by needy persons causes them to seek services many times in their lives, Future’s service approach educates the client to effectively deal with publicly supported service systems. Today, many of Future’s clients are able to manage their own personal affairs by successfully interacting with the numerous public and private bureaucracies common to American society. Future’s ability to act quickly is the result of its extensive contacts with human service and business organizations. In order to properly use such a network, Future had trained its staff and client to appreciate individuality in bringing competing forces together. Thus, Future’s approach stresses the need to identify common interests in order to help competing forces see a way to achieve mutual benefits. In its services, Future has used this approach to link clients into the appropriate units of government in order to ensure that the client receives every benefit to which he/she is entitled. Future has also used this approach in coordinating various business factions by identifying areas in which shared efforts result in greater productivity and economy. Using its contacts in both human services and business sectors, Future provides many clients and outside organizations with the proper channel to locate jobs and/or bring capital improvement needs to the appropriate financiers. Future Associates has succeeded in gaining the trust of professionals in both of these sectors, a feat accomplished by few other organizations. Through its experience, Future Associates has diversified into other areas. Its involvement is now broadened into management of real estate as well as other entrepreneurial ventures such as hotel development. In the mid 1980s through the early 1990’s, Future Associate was involved in the ownership, renovation and management of a hotel in Miami Beach, Florida. In the early 1990’s, after the success of the Florida hotel, Future developed a 5 star hotel in Jerusalem, Israel. It has also developed and is currently involved with AIG insurance and its subsidiaries in providing secondary mortgage insurance abroad. In the mid 1980’s, natural gas was deregulated and Future Associates ventured into the natural gas industry by envisioning Multiut Corporation. Multiut became the only full-service marketer of natural gas in the Chicago metropolitan area. Multiut is a full-service energy provider that couples decades of purchasing and delivery experience with strong service ethics. Multiut’s clients include health care facilities, restaurants, foundries, office complexes, apartment buildings and other business properties.. Having a base of its own businesses to service was again a successful use of its resources. In addition, Multiut has been a leader in electrical audits and cost management, and is currently also providing direct electric power related services. Multiut’s reputation among its clients and their associates is the reason for its continued success. In fact, its growth has been due more to word of mouth than to direct marketing efforts. Multiut’s record as a full-service provider that responds promptly to client concerns and needs, gives it a unique edge in introducing any new energy-related cost cutting products or services. 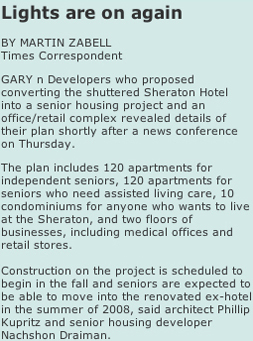 Future is currently involved in the operation of a few nursing facilities in the Chicagoland area. The Peterson Park facility, located in Chicago’s north side, offers a comprehensive rehabilitation program with physical, occupational, respiratory and speech therapy services for residents who have been affected with a debilitating illness, injury, operation or chronic condition. Another facility is located in the Joliet area of Illinois and its quality specialized care services include: post-hospitalization care, restorative nursing, hospice care, and complete In-House IV therapy. Additionally, a facility located in the Burnham, Illinois area specializes in providing care for the M.I. population. In summary, Future Associates encompasses its involvement in various facets of the senior housing, healthcare and related services. These include laboratory services, mobile scan units, the development of assisted living license for the elderly, the management of a company providing various services in the energy and utility industry, the management of real estate properties and the development of many business opportunities.